I’m not sure what’s worse, ASQ’s hamfisted efforts to get its members to side with China over the United States, or its public-facing bungling of its attempts to do so. A reader caught my article from two days ago on how ASQ’s new pro-China policy has infected the pages of its premier journal, Quality Progress, and revealed that the article’s editor was trying to drum up evidence months beforehand, clearly to add credence to ASQ’s position. The new tariffs the United States has placed on foreign steel and aluminum and Chinese imports has cost American businesses millions of dollars. Among those hit the hardest are auto manufacturers, retailers and certain markets in the food and beverage industry. 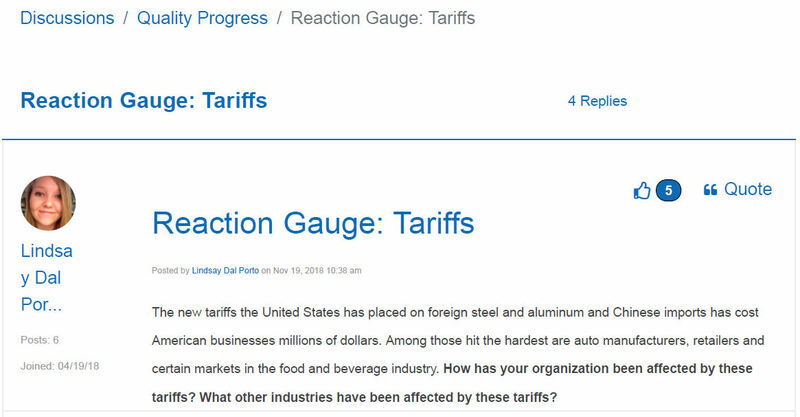 How has your organization been affected by these tariffs? What other industries have been affected by these tariffs? Dal Porto wasn’t listed as the author of the resulting Quality Progress piece, but was credited as the person who “compiled” the report. We still don’t know who actually wrote it. Dal Porto hasn’t answered my requests for clarification on the issue. It’s worth pointing out that as of today — months later — the thread only got 4 replies, and none of them were particularly anti-China, meaning the effort to generate evidence to support a predetermined position fizzled. That didn’t stop ASQ from publishing the piece anyway, of course. Someone needs to start asking ASQ’s Board and executive leadership just why they are so dead-set on promoting China and being dishonest with paying ASQ members in order to do so.